You can read more about Capt. Dunn's ARIA involvement here with more coverage of ARIA 4's role in the Apollo 13 reentry here. Finally, there's an extensive site on ARIA in general called FlyAria. Worn by crew? Yes, by ARIA crew. Type: Partially embroidered on grey twill. Merrowed selvedged (no tail) border. Value: No confirmed vintage sales examples. 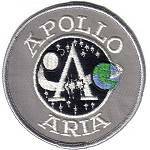 Notes: This is the vintage Apollo ARIA patch produced by Capt. David J. Dunn in late 1970 and distributed to ARIA crew members at the time. All other designs shown here are believed to be later versions. There are clear thread tracks joining the "APOLLO" letter elements on the vintage patch which are missing from all the later versions, including the blue version(s). The two stars under the right leg of the central "A" link up to the base of the A in the original and not in any of the later versions. The gap under the "ARIA" text is narrower in the original than in the later versions. Type: Partially embroidered on grey twill. Merrowed edge. 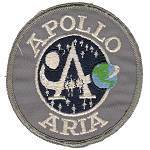 Notes: This patch appears to be a later version of the original Apollo ARIA patch. These tend to appear in pairs along with a blue version as shown below. As mentioned in the introduction above this may be a version produced after the Apollo moon landings, in the 1973-1975 Skylab to ASTP phase. Type: Partially embroidered on blue twill. Merrowed selvedged border (no tail). 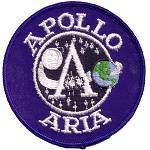 Notes: The creator of the original Apollo ARIA patch from 1970 did not create any blue version of the patch. As mentioned in the introduction it seems possible that this blue patch and the grey version shown above may have been produced around the time of the Skylab and ASTP missions, between 1973 and 1975. Note that an example sold in 2006 at an Aurora space auction ( see image) had a clear black border around the moon on the left of the patch (like the grey versions), whilst the example shown above does not have this feature. It's not clear whether this represents a different version of the patch.